I have been struggling with how to make a Pareto Chart in R using the ggplot2 package. In many cases when making a bar chart or histogram we want items sorted by the X axis. In a Pareto Chart we want the items ordered descending by the value in the Y axis. Is there a way to get ggplot to plot items ordered by the value in the Y axis? I tried sorting the data frame first but it seems ggplot reorders them. But it's still not a Pareto Chart. Any tips? The bars in ggplot2 are ordered by the ordering of the levels in the factor. and it doesn't even need the overplotting trick as lines() happily annotates the initial plot. Developed after reading Cano, E. L., Moguerza, J. M., & Redchuk, A. (2012). Six Sigma with R. (G. Robert, K. Hornik, & G. Parmigiani, Eds.) Springer. But that incorrectly reorders/sorts the bars alphabetically... because that's how levels(factor(names(data))) would be ordered. To simplify things, let's just consider only the estimates. 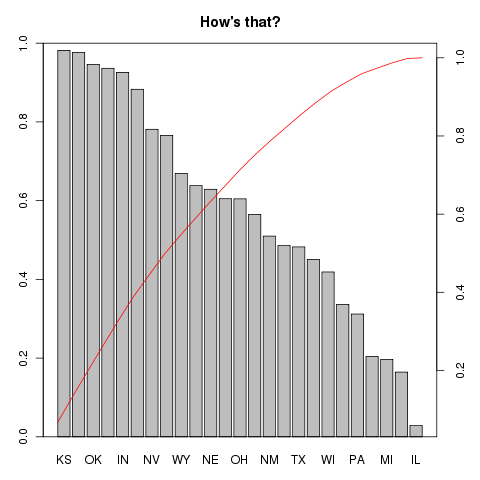 First we reorder the factor levels, so that States are plotted in decreasing order of Value. Similarly, we reorder the dataset and calculate a cumulative value. Now we are ready to draw the plot. The trick to get a line and bar on the same axes is to convert the State variable (a factor) to be numeric. As mentioned in the question, trying to draw two Pareto plots of two variable groups right next to each other isn't very easy. You'd probably be better off using facetting if you want multiple Pareto plots. Not the answer you're looking for? Browse other questions tagged r graph ggplot2 or ask your own question. How to reproduce the pareto.chart plot from the qcc package using ggplot2?